Fianna Fail is promising to appoint a full cabinet minister to look after rural Ireland. 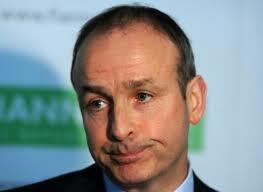 Party leader Micheal Martin says Fine Gael and Labour have decimated it over the last five years. Punishments rural areas suffered under successive Fianna Fail-led governments aren’t mentioned in the statement. Neither is there any reflection of regret that cancer services at what was then Sligo General Hospital were killed off by a Fianna-Fail led government. He likely has forgotten how the thousands of protesters – among them cancer patients – were treated by Fianna Fail ministers when they rallied in vain to have the service retained in the North West. 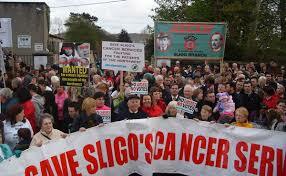 some of the thousands who campaigned against closure of the cancer services at Sligo General. The former Health Minister probably also doesn’t remember that Fianna Fail ministers, TDs and senators voted down a Fine Gael bid to have the proposed closure reversed when the issue came up for debate in the Oireachtas. Martin is no stranger to Sligo, he has been around a few times during the last few months. One of his more recent sojourns was to Tubbercurry. Did he speak to the community there about the pending closure of the long established butter processing operation at Achonry? This is the butter packing facility Aurivo are moving to Cork, Martin’s home county. Did he drop round to chat with the more than 20 workers in Achonry whose jobs are set to be impacted by the decision? He is saying that Fianna Fail protected small schools. He recently visited one in West Sligo where parents had to fight tooth and nail to keep it open in the face of Fianna Fail government attempts to close it. It’s imagined there were many other small schools where the efforts of parents to keep them open weren’t as successful. They are reluctant to accept that, in government, they presided over the greatest economic and social catastrophe ever to befall the State; blaming it instead on conditions in the global economy. Fianna Fail, Martin says, will “breathe life back into…communities” and offer “focused proposals” to strengthen the hand of rural Ireland. “We want to reverse that trend” of Fine Gael and Labour decimated rural services. He seems to believe that the disastrous management of the economy during the last Fianna Fail government is in no way responsible for any of this. Despite their accusations and finger-wagging in the direction of the outgoing Coalition, it is widely thought that Fianna Fail will eagerly hitch their party wagon to Fine Gael to help form the next government. After all, they are virtually the same politically. The draconian measures with which Fine Gael and Labour have been hammering the people in the last five years were among those the previous Fianna Fail government signed the country up to in the agreement with The Troika. The agreement contained binding commitments, including the setting up of a national water utility, Irish Water; water charges and the imposition of taxes on the family home. The Fine Gael and Labour Coalition ran with this, while adding several new taxes and charges of their own, as well as demolishing welfare benefits, destroying crucial public services, closing rural garda stations and reducing garda numbers, the latter begun by Fianna Fail with the shutdown of the Templemore Garda Training Centre. Fianna Fail has stated that they are committed to charges for water once the the existing Irish Water body has been restructured. They also remain wedded to the property tax on the homes of families. At the local level, Fianna Fail and Fine Gael members of Sligo County Council have repeatedly blocked moves aimed at reducing the tax on homes in the county.